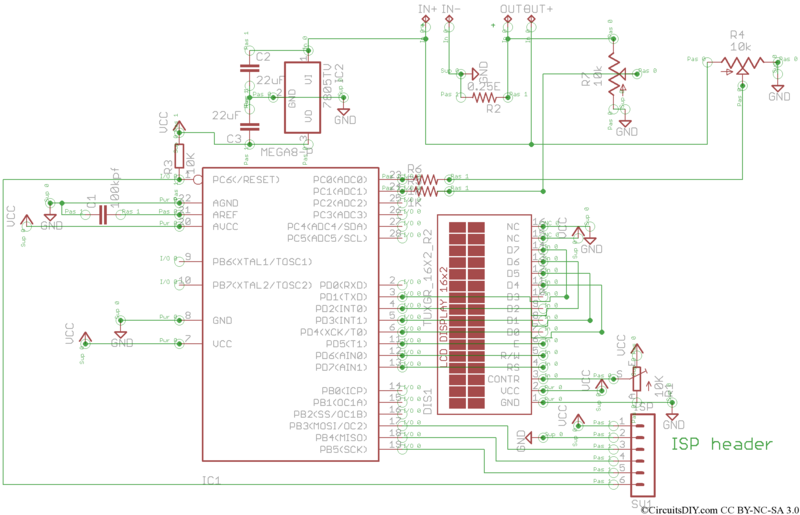 Better Amperes display resolution while using low value drop resistor. 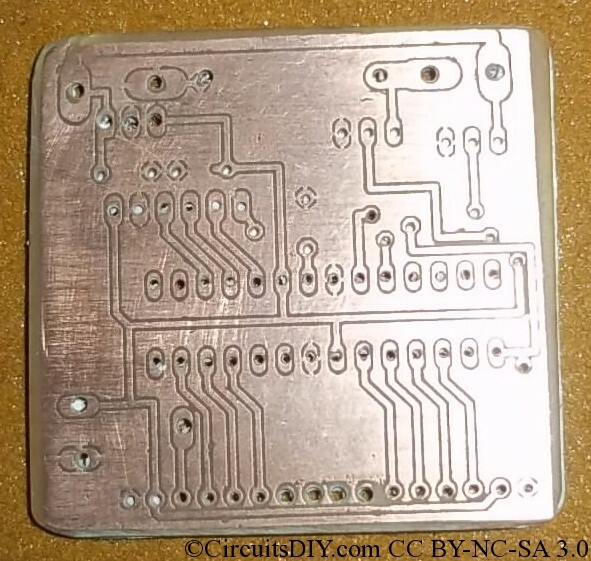 Much smaller PCB size, only 5cm x 5cm. Still no SMD components. Easy calibration, only one voltage adjust and one ampere adjust preset, no voltage out detection. 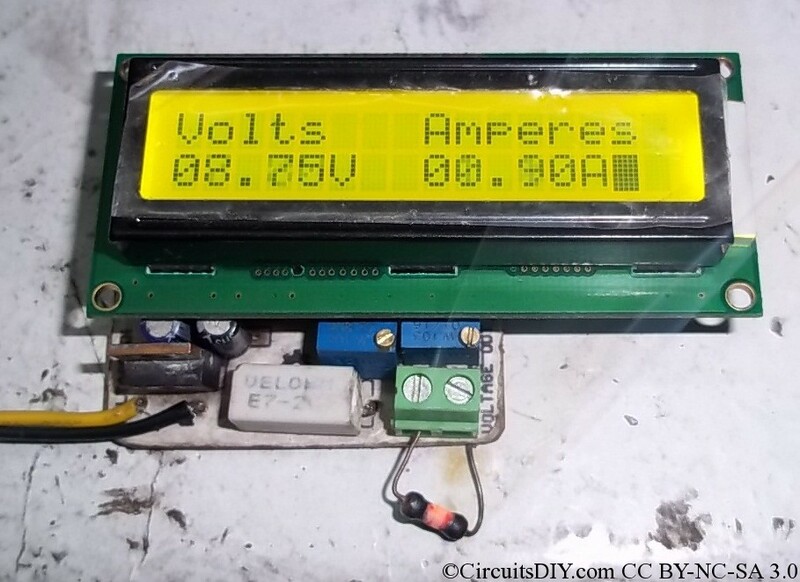 The 10Ohm resistance is connected and is burning :P. Voltage dropped to 8.75~8.80V and hence Amperes would be 0.875~0.88Amps and it is displayed here as 0.90Amps. It’s perfect as the meter is having 100mA resolution. 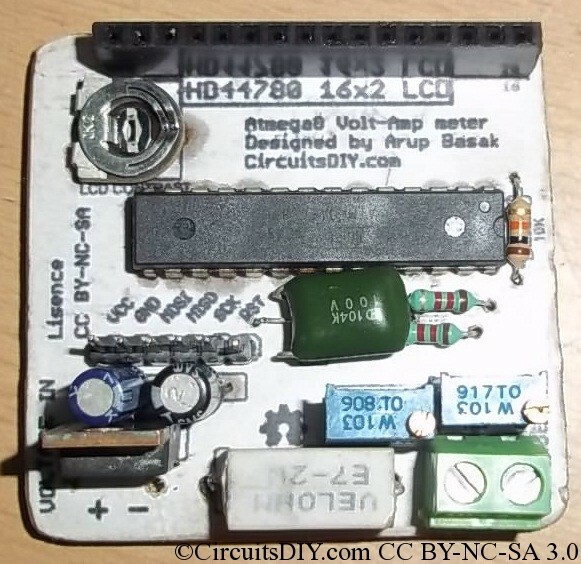 Connect a 5V DC supply to the voltage input. And short pin 1 and pin 3 of the LM7805 regulator. Now tune the rightmost preset to show 5.00V on the LCD. Now connect any real power supply of say 12volts. 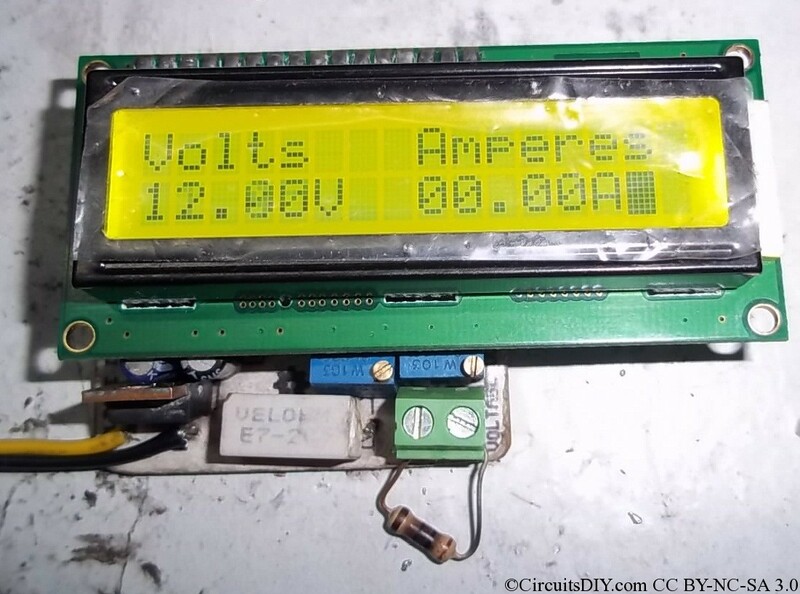 Connect a load at output, say a auto lamp, Measure current with multimeter, or calculate Amperes, and then tune the 2nd rightmost preset to show that reading of Amperes on LCD. UPDATE:- The previously uploaded compiled HEX file had some problems. Use this hex file with fuse settings. i am getting blank on display ,i checked my hard ware all are good ,give be some suggestion for burning hex ,hope some trouble in fuse settings . Thanks for sharing your thoughts about 1040 car donation. I have same problem with LCD display. I see text. and then an extra MCU reset on GND.Dann I can see everything. If I give RS LCD signal of short pulse high and then give MCU reset the software works. I have found the error in Maim.c. The new hex file can I send. Hey Henri, could you please share your working circuit diagram and C code with us ? Thanks Henri, I apologize that I’m not the author/creator of this project, and original author is currently busy. But from where did you got the hex file ? Is it from the Downloads section in this tutorial ? 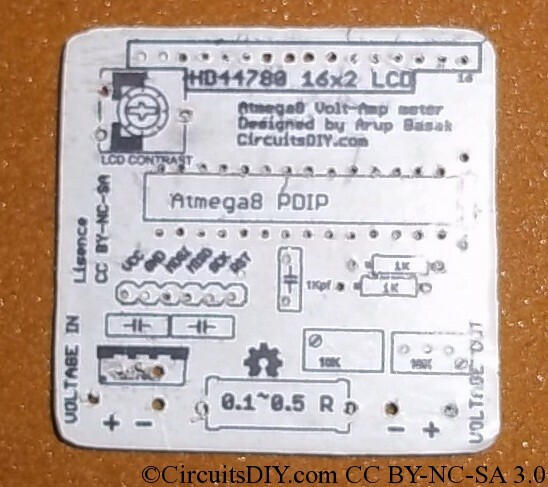 I made the circuit as on the blog, and that’s not a problem. I’m looking for the software (Hex file) that works, the software does not work on the blog. If I have a good HEX file and it works well, then I will confirm that with pictures. Thanks ! I’m waiting for your working HEX file. Make sure your atmega8 is tuned for internal 8Mhz oscillator. THE Lfuse and Hfuse and Xtal frequency are all set correctly, the PCB layout is also correct and I program with the programmer and the programming software PonyProg, any many other circuits that I have to work flawlessly already, so I think is wrong with Hex file uploads to the site. We are sorry for this project if it can not work. Do you sometimes have the correct working hex file and please please pass it forward. Hi there. If you need, I’ve uploaded a new hex file which operates at 1Mhz. Check at the end of the article. Thanks. wolte das projekt nach bauen,aber die hex geht nicht? great post! thank you so much for sharing this. cheers! I have question , I try for Voltage (Out +) it ok, but for amp (Out -), MCU cannot detect analog signal, because current go pass resistor 0.25ohm (3W) not go to Potentiometer 10K. Anyone can help me?